We discovered this amazing hotel through booking.com. We were flying from Europe to Mauritius and couldn't make the connections work. Being Australian's most flight connections for us are no longer through Singapore or Kuala Lumpur, they are mostly through UAE. Emirates who is partnered with Qantas flies in and out of Dubai so we usually pass through that UAE city. We have been to Dubai and Abu Dhabi probably a dozen times as not only do we fly through there, my husband has clients in both cities so neither are new for us. ​Keeping this in mind, we didn't really want to stay at the beach or right in Old Dubai as we had done that before and wanted instead to make the most of the time and catch up on some work. This was how we discovered The Meydan. We stayed here again just last week coming through from Europe again and it was equally as perfect this time around. It is out of the city but an Uber to Dubai Mall is super affordable and will cost you around $40-60 AED which is around $15-20 AUD so pretty reasonable. It takes around 10-15 mins. ​NB: Uber run slightly different in Dubai. They are partnered with Taxi and Limo companies so your ride will sometimes be a taxi even though you are doing it through Uber. 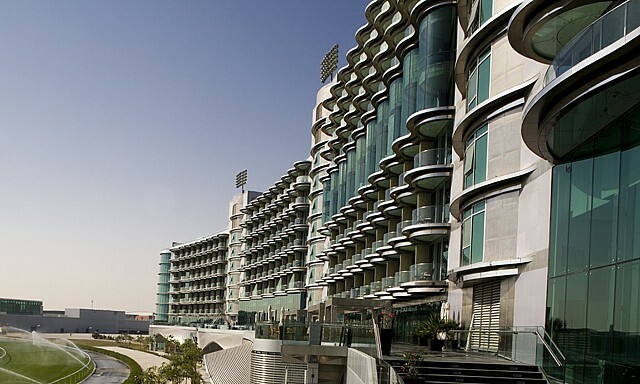 The Meydan Hotel - 1.6km long and as luxurious as you would expect from a Dubai Hotel. I would recommend getting the executive room. This room level comes with a heap of added extra's which are really worth the extra money you pay for this level. ​We usually expect to pay around $230AUD for the Executive Room which apart from anything else gives you a 3pm check out. If you want to move it to 6pm its 60 UAE per hour which is around $20AUD. So for an extra $60 we lounged until 6pm when our car was picking us up for the airport. ​Looking on booking.com today for a room this week, their standard room (which is anything but standard) is priced at $126 AUD!! WTF - that is amazing value! Booking.com is usually around $40 cheaper than the other hotel websites for this property. Keeping in mind they are coming into Summer and its already over 40 degrees c during the day in Dubai. My search today shows ​The Executive Room is $162 (cheapest I've ever seen it) and along with everything you get with the usual room you can access these amazing facilities: (all free!). Please keep in mind this price includes my 10% Genius discount as well. ​NB: Make sure you choose the room with "Executive" in the name. You can't add it later and the other rooms are pretty much the same, they just might have bigger balconies but rest assured THEY ARE THE SAME ROOMS (except for when you start choosing suites and two bedroom penthouses) so you need to choose the one that has Executive in the name. Private Airport Transfers To and From Dubai International Airport (24 hours advance reservation is required). You simply email the concierge once you have booked. It was Ramadan when we were there so Shibu their Asian inspired restaurant was closed but they had an amazing Ramadan tent for Itfar (the evening meal during Ramadan) and I would have loved to have done that but sadly our flight left not long before sundown. Location: Fantastic. Beautiful Hotel, amazing pool, free breakfast, morning tea and pre-dinner canapes with the Executive Room and not too far from the hub of downtown. Staff: Lovely - very friendly and accommodating and while you do tip the porters they never make you feel like you have to. You never feel like you don't belong. Ever. Facilities: Great - breakfast is excellent, a variety of restaurants that while they aren't cheap, they aren't hideously priced for the quality that they are. You can survive though with breakfast, morning tea and pre dinner canapés and then just head into town for dinner if you like. ​Beware: The minibar is hideously priced which seems strange when the restaurants while expensive aren't awful. 30 AED for a can of sprite which is $10 AUD so beware. Value: - Great. Usually prices at around $230 AUD at booking.com. The only reason I gave it 4 stars was the mini bar prices stopped me giving it 5.